Home » Nissan » Nissan Leaf Taxi passes 160,000 km and still on 1st set of brake pads! Nissan Leaf Taxi passes 160,000 km and still on 1st set of brake pads! A Nissan LEAF taxi in Cornwall has clocked up its 100,000th mile (160,000 km) since entering service with C&C Taxis in 2013. 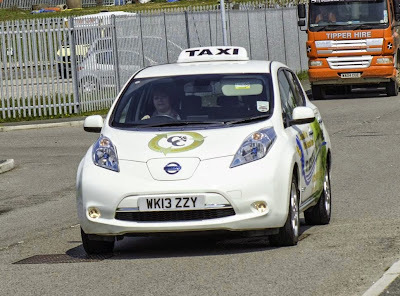 ‘Wizzy’ as it was named by operators at St Austell-based C&C Taxis, hit the milestone in the course of more than 25,000 pure electric paying fares and having been rapid charged over 1,700 times yet retains near full battery health and is still on its first set of brake pads. Inspired by Wizzy’s performance, C&C Taxis now operates five 100% electric Nissan LEAFs and an all-electric Nissan e-NV200 van. Mark Richards, fleet manager at C&C Taxis, estimates that each vehicle saves the business around £8,500 per year in fuel bills and maintenance costs. “It’s no exaggeration to say Wizzy has transformed our business. We took a gamble when we bought her but she’ll have paid for herself in just 24 months and the savings we’re now making across the fleet are phenomenal,” he added.